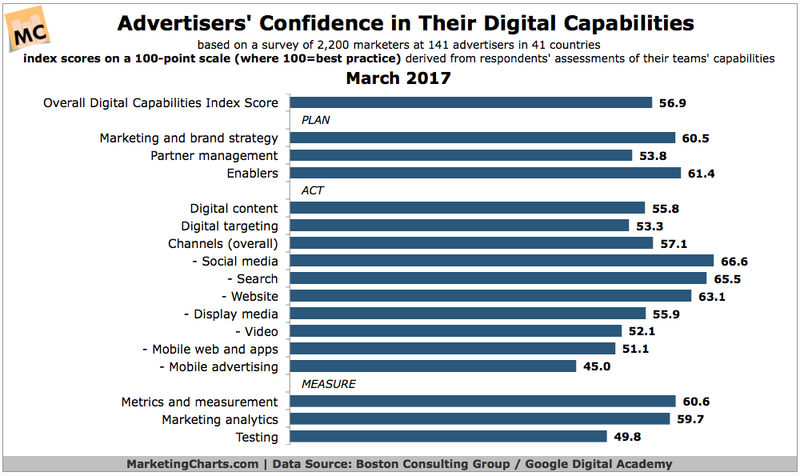 Modern marketers have some tech-savvy CMOs to emulate; take a survey on marketing, service and trust; limiting display ads doesn't change cost or visibility; this week in fake news; resurrecting a brand reputation via advertising; Facebook continues to copy Snapchat; Google gives external companies audit rights to avoid ad controversy; Uber has [another] a bad week of publicity; the battle for autonomous and artificial intelligence talent; the pending fourth Industrial Revolution; creating an audio hook for your audience; how brands should work with influencers; how to set up a VPN; a 3-part series on data and analytics in crisis planning; a key interview technique you're missing; and more in the trust edition of The Full Monty. We're sure you subscribe to The Full Monty podcast, and don't forget check out where Brain+Trust is speaking (final section below). The modern marketer needs a variety of skills to succeed. From GE to Lego, to Hilton and Geico, these tech-savvy CMOs embody the talents so desperately sought after in this ever-changing environment. IBM highlights seven women who are shaping digital marketing. You're a modern digital marketer and customer service thought leader. Please take this survey on digital marketing, customer service and trust from Jay Baer and Susan Baier (no relation). As more and more brands find their ads popping up next to toxic content like fake news sites or offensive YouTube videos, JPMorgan Chase has limited its display ads and seen little change in the cost of impressions or visibility of ads. 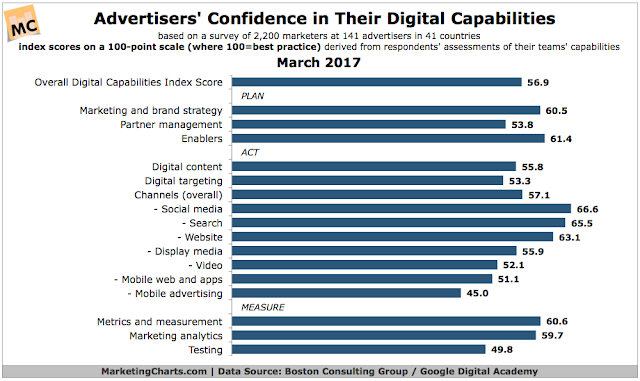 Marketers' digital capabilities haven't improved in the past 18 months, with middling self-assessments at best. Where are they most and least confident? Tensions are escalating as the Netflix evolves into a direct competitor to the traditional studio model, investing in more than 70 original shows this year, is hogging talent, pushing up prices, and spurring pushback from rival TV producers who once saw it as a partner. Netflix: the Monster that's Eating Hollywood. It looks as if BuzzFeed will be going public in 2018. The media company with the sensibility of a tech company is positioned well to make a splash in the IPO market. The information war is real and we're losing it: “Strange clusters” of wild conspiracy talk, when mapped, point to an emerging alternative media ecosystem on the web of surprising power and reach. Can trust in the news be repaired? A global coalition of tech leaders, academic institutions, nonprofits and funders, including Facebook, Mozilla and Craigslist founder Craig Newmark, announced a $14 million initiative to combat declining trust in the news media and advance news literacy. Related: there's a new marketing strategy called millefeuille. "The millefeuille approach to food marketing involves taking a simple recipe for an existing, already popular product, and whipping it up into a fluffy layer cake of confusion." Case in point: Cheetos spring fashion line. The fast food brand Carl's Jr. lost its way with risque advertising featuring buxom blondes in recent years. They're rebooting their advertising with a clever, funny and self-aware spot that highlights their origins over their recent distractions, with a fictional Carl Hardee, Sr. in the starring role — a nod to the combined brands of Carl's Jr. and Hardee's. Showing that they've heard feedback and can be self-deprecating may give the brand a boost, in addition to their focus on quality ingredients and lower-price alternative to other similar chains. If you're looking for a quick overview of Flipboard, this Moment from Twitter has some highlights to help direct you, including the ability to create your own custom magazine, a handy Chrome plug-in and more. Twitter has finally stopped counting @ replies in its 140 character count. And only a year after they first floated the idea. At this rate, we should be able to edit tweets by 2019. Maybe they'll have a full-time CEO by then too. In an effort to spur video ad dollars, Twitter is selling pre-roll ads on Periscope videos. The ads are powered by Amplify, Twitter’s existing pre-roll video ad product. Twitter's new hate-speech filters can have another useful purpose: to help you avoid television spoilers. That is, if you're still on Twitter. An enterprising journalist has ferretted out FBI Director James Comey's Twitter account. More than the unveiling, there's an important lesson here for anyone looking to understand how analytics and insights work, and this goes well beyond Twitter. Take special care to look at the techniques employed by the reporter, and how she was able to draw her conclusions. Facebook made some drastic changes to its main app last week. The camera is front and center as a communications method, with filters, effects, and stickers, and 24-hour disappearing Stories as a new feature. Dan York looks at the changes with an eye toward how Facebook is focused on killing Snapchat. Recode noticed that with the changes to the main Facebook app, Messenger, WhatsApp and Instagram, all of Facebook's apps now look the same. What's to differentiate each between audiences? At the upcoming f8 developer conference, Facebook will launch group chatbots inside Messenger — a challenge to Slack. Messenger now includes Live Location, a feature that will allow your friends to find you (and doing so with minimal impact to battery life). The "Town Hall" feature has officially launched within Facebook, giving users the ability to easily locate, follow and contact their local, state and federal government representatives. More movement along Facebook-as-a-utility and Facebook's commitment to public policy. One brand figured out what it had to do to increase sales by 50%: redsign its packaging so it looks good on social media. 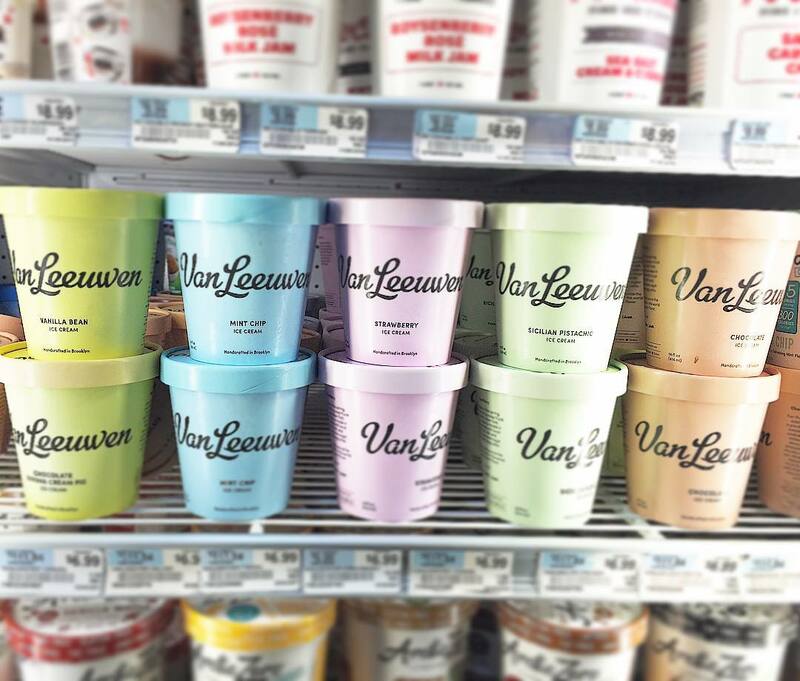 That's right, the Brooklyn-based Van Leeuwen artisanal ice cream went full-on hipster to be more Instagrammable. YouTube is seeking to clean up the ad-placement furor for advertisers by giving them five new filters to prevent their ads from appearing alongside offensive or extremist content. Google added that the problem is quite small, but also noted that YouTube will start letting outside companies like DoubleVerify and comScore audit its efforts to keep ads away from controversial clips. Waze has a new Order Ahead feature that will allow drivers to place an order via its app. The first QSR company to partner with them is Dunkin Donuts. Other franchises will be added, including Taco Bell, McDonalds and Starbucks. Microsoft added automated call routing and analytics features to Skype for Business, as Amazon and Google push into the space with Chime and the new Hangouts. Following recent city legislation that banned advertising short-term apartment rentals, a New York City Airbnb host was fined $1,000 for listing and renting out an apartment in Trump Tower. Welp, there goes Melania's plan to do the same if she ever decides to move to the White House. There's no easy way to say this. If you're an Uber driver, the company is manipulating you. Uber is engaged in an extraordinary behind-the-scenes experiment in behavioral science to manipulate drivers in the service of its corporate growth. Employing hundreds of social scientists and data scientists, Uber has experimented with video game techniques, graphics and noncash rewards of little value that can prod drivers into working longer and harder — and sometimes at hours and locations that are less lucrative for them. Uber will be shutting down in Denmark next month, where it has 2,000 drivers, after new taxi laws mandated that cabs be fitted with seat occupancy sensors and fare meters. "Something is rotten in the state of Denmark." — Hamlet, Act 1, Scene 4. Lyft is testing Shuttle service in San Francisco and Chicago with fixed pricing and a set route, running on weekdays from 6:30-10 a.m. and 4-8:00 p.m. Another public transportation, UberPool and Via competitor. Ford has an idea of how we'll get around in the city of the future, whether or not it involves cars. Amid the recent and continual crush of negative news, Uber published its heralded diversity report, which indicated that Uber is no better than its Silicon Valley confederates. And to complicate matters, the page included names of employee resource groups (ERGs) that, although they were named by employees, were nonetheless tone deaf to Uber's woes and how they might be perceived by external audiences. The Google-turned-Uber executive at the center of a high-stakes legal battle between the two companies in their autonomous vehicle programs is refusing to testify or hand over related documents. As in the intellectual property that he allegedly stole from Google before departing for Uber. He sounds like a perfect fit for the Uber culture. It's becoming increasingly difficult to retain good self-driving talent, as they flee one company for the next. Similarly, big corporations are hoarding the world's best artificial intelligence talent. Which is great if you're the talent, but difficult if you're a smaller competitor trying to gain a foothold. It is actually developing economies that are poised to be hit the hardest by the fourth Industrial Revolution, or “Industry 4.0,” where machines are networked together in “smart factories” that have little need for human input. The question is, assuming that this trend toward the networked automation of factories continues — and there is little evidence to suggest that it won’t — what happens next? Domino's (featured in last week's edition) has outperformed tech stocks, and its robots will deliver your pizza. Just don't forget to tip. You don't want to mess with a robot. Interviews with Elon Musk, Bill Gates, Ray Kurzweil and others indicate a wide range of predictions and concerns about AI in coming decades, its regulation, and possible implementations. Can AI make you a better tweeter? The startup Post Intelligence hopes it can. Microsoft has over 150 apps for HoloLens and has hired former Oculus CMO as a corporate vice president. The latest move in making mixed reality a core part of Microsoft's DNA. Pandora is preparing to launch Premium, which gives listeners the ability to pick music on demand for $9.99 a month. The company needs to convince more of its 81 million freeloaders to become paying customers if it wishes to remain independent. Spotify acquired MightyTV, a video discovery platform, which is likeTinder for video content. Is Spotify about to move into video discovery as well as music discovery? The ad model for podcasts seems like a return to the good old days of radio and TV. InStore Audio Network reaches 35.5 million Americans every day. How much thought have you given to this particular audio channel? The popularity of audiobooks is being driven by an obsession with productivity, and the medium of audio makes it perfect for multitasking. Just make sure you're listening to The Full Monty with your undivided attention, okay? If you want to know how to hook your audience, NPR has the best advice. Did you ever have a song enter your brain, and you just couldn't get rid of it? Fear that earworm no more, for Unhear It is here! Program of the Week: Everyone's been talking about S-Town, the latest show from the producers of Serial. It's a medium that transcends true crime. Do you have a program to recommend? Add yours to our Google Sheet: smonty.co/yourpodcasts. If you're focusing your content marketing efforts on headlines and click-bait and your writing is sub-par, you're missing the point. Instead, concentrate on content strategy, says Rebecca Lieb. There are two models of brand newsrooms — physical and virtual — and you need to find the model that works best for you. Examples include Reebok, Nestle and SoFi. Jay Acunzo has a simple rule for how brands should work with influencers: think about retention versus acquisition. Amid worries about bad behavior and content by third-party influencers, Doug Simon recommends companies to think about internal experts as influencers. The on-protocol and by-the-book customer service messaging didn't work for United last week. What would have made the difference? It's the topic of Episode 27 of The Full Monty. Listen in for commentary, trivia, and the poem of the week. And please leave a rating and review wherever you subscribe. Already as secure as sieve, consumer privacy rules for broadband companies were completely loosened by Congress last week. But Comcast, Verizon and AT&T have said they will not sell consumer data. Naturally, enterprising individuals have set out to inform you how to set up a VPN and why you'd need one to protect yourself. Although Brian Krebs wonders if you even need a VPN, since you're then beholden to VPN companies' use of your data. If you're going to read one article on the Internet privacy vote and selecting a VPN, read this one. An important long read from Avinash Kaushik at Google about the implications of artificial intelligence on marketing, analytics and you. You're going to want to bookmark this. Most marketers are not well-versed in marketing technology. So you may want to review these 32 questions you should ask when you interview a martech leader. Nasdaq Corporate Solutions and KRC Research issued findings from their Chief Communication Officer Measurement Survey. 90% of CCOs agree on 12 different KPIs to continue tracking, yet they actually track far fewer. And 10% of them still view Advertising Value Equivalency (AVE) as a favorite KPI. What century is it? The 2017 Edelman Trust Barometer indicates you may need to take a different approach to managing your crisis communications efforts. We mentioned interviewing in the Measurement / Analytics section above. You might want to think about the single most important interview technique that nearly everyone omits. Remember: empathy is the most critical of human emotions. Last week we shared a couple of links about the importance of quiet time. Here's how the gurus do it. Ten Tenets of Public Speaking. Note I didn't write "tenants" either. A recent analysis of 700 presentations found that messages that include stories are 35% more persuasive, 21% more memorable than those that do not. If you want to vastly improve your presentation skills, I'd recommend signing up for Tamsen Webster's Red Thread Retreat in May. It's never going to be offered at this price again.